We presented Alex Hemingway, Policy Analyst from the Canadian Centre for Policy Alternatives (CCPA) in a discussion on public education and advocacy. 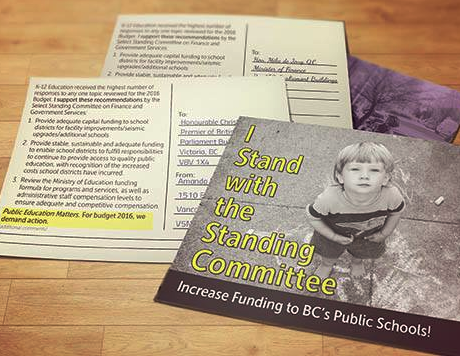 February 24, 2016 Panel: What's happening to public education in BC? Please refer to the updates on the homepage and the news section for the most recent media coverage. Press Releases are also above. Roundhouse Radio - Our City, February 15, 2017 - Andrea Sinclair with Kirk LaPointe. Reaction to the Throne speech and our Declaration. ​April 12-14, 2016: Presentations to the VSB Committee of the Whole from PAN and others. Will be updated as we receive them. ​April 8, 2016: Georgia Straight article on the PAN push for renewed arts education support. Article here. Read our original post here and our presentation here. CTV at the event Opens with footage behind news anchor of PAN at Canada Place and more (at 9:36-10:45 approximately). Global News, enrollment is up in BC, what are parents demanding? ​Simi Sara Show, PAN member and Charles Dickens Elementary PAC Chair Andrea Sinclair, January 22 2016 discussing seismic upgrades and the call for school closures.